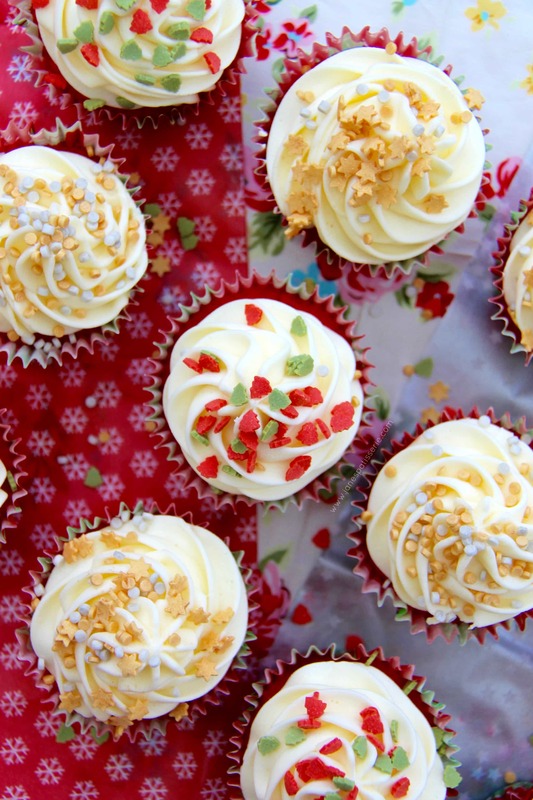 Deliciously light & fluffy Red Velvet Cupcakes with a gorgeous Cream Cheese Frosting – perfect Christmas or everyday cupcakes! A couple of weeks ago I posted my recipe for my Red Velvet Cake and it was a massive success – its one that you were all waiting for for a very long time! I had however had many requests for a cupcake version, so here it is! You will see however that my recipe isn’t just my Cake recipe halved as I believe this version bakes better as a cupcake, and the other as an actual cake – so there is a difference! I was flabbergasted with how red my cupcakes came out – such as they look like they have been edited beyond belief, but they really are that red! Its mind-blowing! 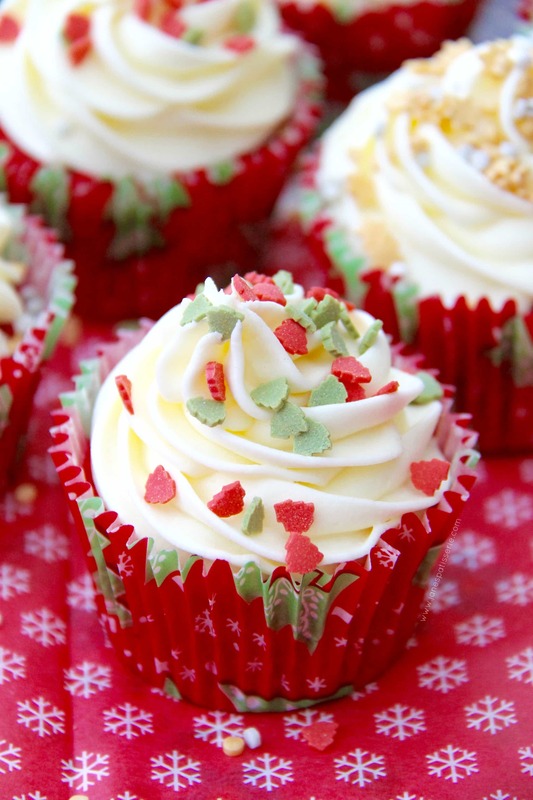 This meant they were the perfect red to make these my Christmas Cupcakes – and don’t they look cute! Just look at those cases & the sprinkles – I am a little bit in love. Red Velvet is one of those controversial cakes – its like why on earth does a cake need to have vinegar in it? and do I really have to use buttermilk?! But honestly – a classic ‘Red Velvet’ contains these ingredients – and you can’t really avoid them. 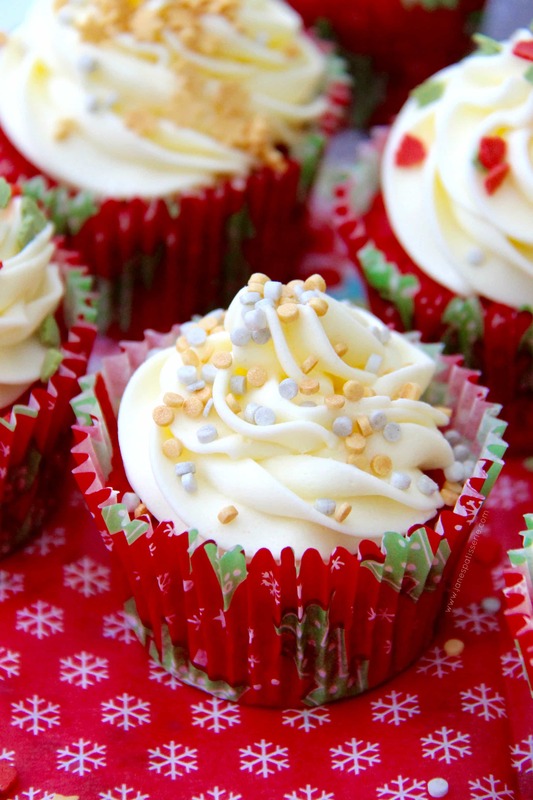 You can of course just bake vanilla cupcakes and use food colouring, but Red Velvet is meant to be Chocolate AND Vanilla but be super red – the bicarbonate, vinegar, and buttermilk help create the texture and bring the colour out more! My first Christmas recipe of the year – my No-Bake Baileys Cheesecake – was a downright HUGE success, and I know this recipe will be also. They are really addictive, and I’ve made these many times before (before I was gluten intolerant!) and they’ve always been a hit. Enjoy! 1) To Bake the Red Velvet Cupcakes – Preheat your oven to 170C/150CFan and line a 12-hole muffin tray with muffin cases – leave to the side for now. 3) In a small bowl, mix together the Red Food Colouring, and Vanilla Extract to a paste – Add this mixture to the butter mixture and beat until combined and coloured well – turn the speed down so its slow and mix in the cocoa powder. 4) Pour in half of the buttermilk and beat on a slow speed. Add in half of the flour and beat again, and then the other half of the buttermilk & beat, and then the other half of the flour & beat (I realise this is faffy, but it works!) Finally – beat in the Bicarbonate of soda, baking powder, and vinegar. Beat again briefly until everything is smooth and incorporated well. 5) Spoon into the muffin cases so its even – I use a cookie scoop and fill the cases about 2/3 full so that its even across them all – bake for 20-25 minutes or until the middle of the cupcakes come out clean when poked with a skewer! Once the cakes are baked, leave to cool on a wire rack. 6) To make the Cream Cheese Frosting – With a stand mixer, beat the butter for a couple of minutes so its really supple and smooth – gradually add in the Icing Sugar, and the Milk so that its a smooth buttercream. 7) Loosen the cream cheese slightly with a spoon then add to the buttercream – briefly mix together so that the mixture is smooth. 8) Pipe your frosting onto the cupcakes with whatever tip you like – I used a closed star – and then sprinkle on your favourite sprinkles! Enjoy! I really really really recommend in investing in good quality Red Food Colouring for a red velvet cake – I use Sugarflair paste colours which you can buy online, or in cake decorating shops etc – but they don’t have a funny taste to them, you use far less to make them work, and they last so much longer!! These cupcakes will last for 3 days covered, if hot store in the fridge! 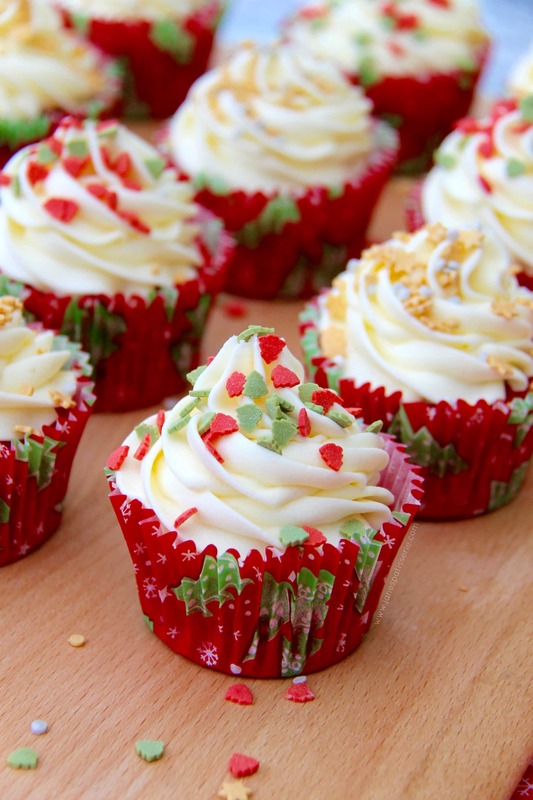 Find my other Cupcake & Christmas recipes on my Recipes Page! Older Next post: Gingerbread Men! Newer Previous post: Christmas White Chocolate Bark! 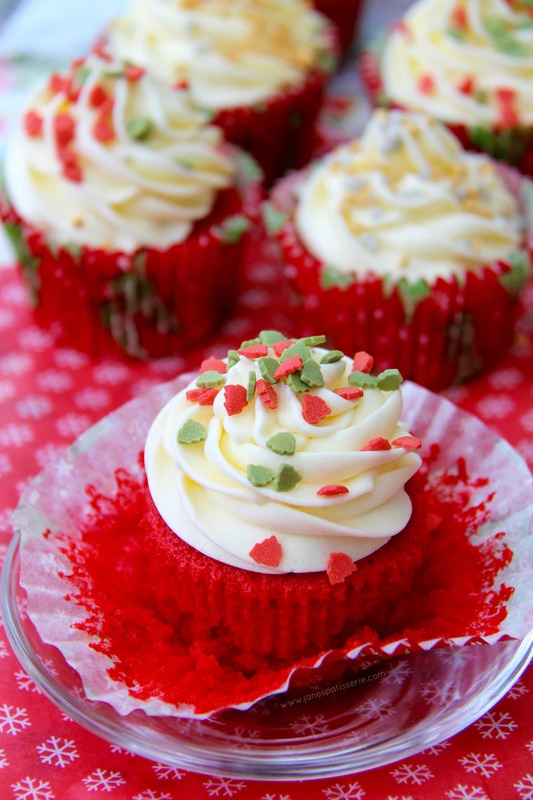 Someone has asked me to make red velvet cupcakes and decorated with sugar roses…two questions, would the flowers work on cream cheese or woild they bleed and go soft. Also would they be ok out of the fridge if i was making on the sat amd being eaten on the sun? I would be using floral paste do you think this wouod be ok? They look amazing, will try them today (not Christmas, but sure they will still go down well). Made these today as a birthday treat for a friend. Absolutely gorgeous cakes. Recipe was easy to follow. Needless to say there aren’t many left now! After finally finding the best red velvet recipe from your red velvet cake I was even more impressed with your cupcake version! I did however use a different cream cheese frosting recipe, one that I’ve always found really reliable in the past and the results were great. Hi Jane. Absolutely love your blog and I’ve been trying out so many new recipes using it, and they’ve all gone so well… Except for this one. I copied the recipe to a T but the buttercream turned out really liquidy. If I tipped the spoon it just dropped straight off it, and I ended up spreading it onto the cakes. I have no idea why this happened, help!! Chances are is that you over beat the mixture too much – with cream cheese frosting you have to be really careful not to beat it like crazy as it’ll loosen it. Also, the cream cheese might have had some excess liquid in it which wouldn’t have helped… sorry you had troubles! This looks amazing! I can’t wait to try!!! Thanks for the great recipe. 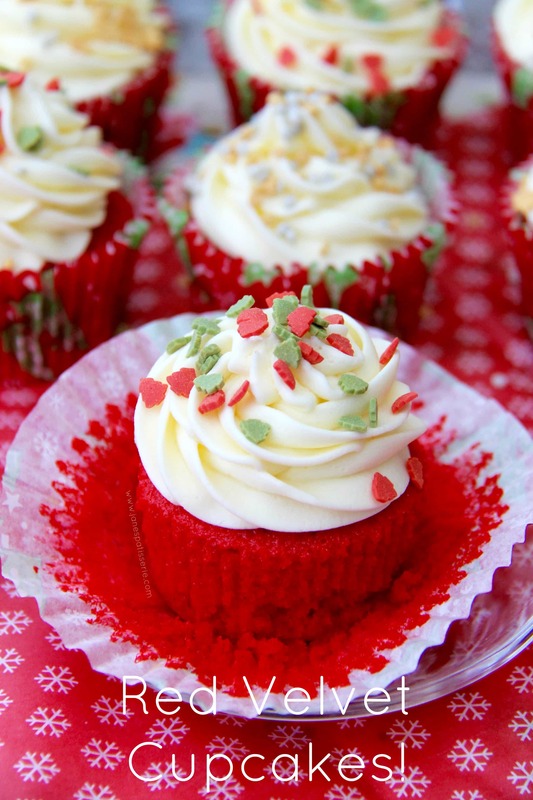 Love red velvet cupcakes! They are definitely common around this time of year with the holidays.